THE STORY follows two immigrant families—the Herslands and the Dehnings, who connect through marriage. THE SETTING features an East coast city called Bridgepoint, a stand in for Baltimore, Maryland, and a West coast city called Gossols, a stand in for Oakland, California. 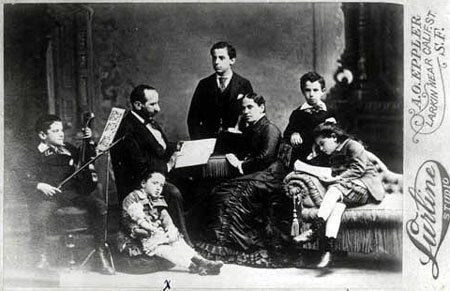 MAIN CHARACTERS include Henry and Jenny Dehning, the parents of Julia Dehning, who marries Alfred Hersland, and David and Fanny Hersland, the parents of Martha, Alfred, and David junior (although he is not referred to as "junior"). THE FORM refuses to be categorized as a novel since it does not adhere to the conventions of plot, linear time, dramatic structure of rising-climaxing-falling action, character development, or one point of view. Rather, the book is filled with portraits and meditations as well as pervasive discussion on how this particular book is being written. 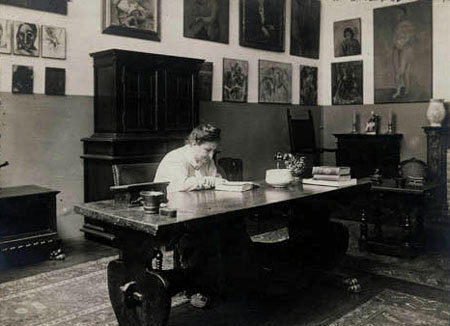 THE INSPIRATION was pure Stein working to distinguish American writing from the Old World European traditions. Though loosely based on her own personal family's history, The Making of Americans kicked off the Modernist Period and was written before the better known Modernist tomes by Marcel Proust, James Joyce, Ezra Pound, T. S. Eliot, and Virginia Woolf. To show the readability of this work, the Steiny Road Poet lists the opening and closing sentences of the major sections of The Making of Americans (MoA). "Once an angry man dragged his father along the ground through his own orchard." "I am writing for myself and strangers." "There will be very much history written of the ending of all of them of the Hersland family written later." "I have been giving the history of a very great many men and women." "This is the ending of this way of telling about being having been and being in Alfred Hersland and Julia Dehning." "I do ask some, I would ask every one, I do not ask some because I am quite certain that they would not like me to ask it, I do ask some if they would mind it if they found out that they did have the name they had then and had been having been born not in the family living they are then living in, if they had been born illegitimate." "Any one could remember this thing, his having been a dead one, his having been a living one." "Any one has come to be a dead one." "Any family living can be one being existing and some can remember something of some such thing." What this stream of first and last sentences gives the potential reader is both a glimpse into how this symphonic work progresses and a temperature check on the Modernist's emotional path. The first section of the book starts in a familiar storytelling way. The last sentence of the first section assures the reader that the introduction of the immigration and child-rearing stories of the Herslands and Dehnings are done, making way for the portraits of the adult children, starting with Martha Hersland, the oldest child of David and Fanny Hersland. The opening sentence of the Martha Hersland Section, "I am writing for myself and strangers," is the author talking but Martha is somewhat modeled on Stein, especially Stein's childhood which manifests in a vignette about little Martha throwing her umbrella in the mud when she is abandoned by her schoolmates. The end sentence of this section indicates the importance of history with its life and death aspects. More or less this last sentence carries through Alfred Hersland and Julia Dehning section. The David Hersland section gives a clue to its more experimental style but this section continues the emphasis on the cycle of living and dying, which is all part of the story of making Americans. 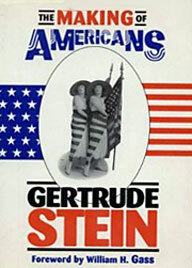 The final section puts a cap on Stein's psychological and philosophical history of Americans. The way the Steiny Road Poet read this novel was out loud for the most part. Going on retreat to a writlerly house in New Hampshire was a plus. She also marked up her copy, taking time to note surprising passages and to meditate on various lines. Here are just a few examples. This passage notes the trouble the Hersland children had with their father over their health care, which included alternative and homeopathic methods. This was based on Stein's experience with her father Daniel Stein and surely had some influence on her studying at Johns Hopkins University for four years to be a medical doctor. Stein uses her novel to expound on her theory of Bottom Nature (the essence of a person's behavior) but in this passage, she reaches beyond her Bottom Nature classification and talks about romantic temperament. It's surprising in a novel about Americans to find an international figure like Napoleon. Certainly Stein favored the way the French lived and let live over stodgy Americans who worried about behavior that might step outside the bounds acceptable to church-going individuals. If anyone entertains the notion that Stein was so egotistical that she ignored what was said about her experimental writing, this quotation should put an end to that thinking. Typically Stein used simple Anglo-Saxon words. Her intention was to use words that still retained their meaning. Stein catalogues living, which includes doing and being as well as all the contradictions. The list is far longer than the passage quoted above. The Steiny Road Poet tosses out this final idea—blog your progress. Make a contract with your readership to spend quality time with The Making of Americans. Reading this Modernist masterpiece can be a fun project. And be sure to put the Steiny Road Poet on your blog notification list!